i have a confession to make: i have ugly heels. like, gross, cracked, totally fugly please get those away from me heels. if i had a dime for every time a nail salon attendee has said, “WHY IS YOUR SKIN SO DRY? !” i’d be a millionaire at age 28.
it’s no surprise, then, that i’ve tried nearly ever foot scrub and foot cream under the sun – because all a girl wants is some smooth feet, you know? unfortunately, nothing works like a good pedicure, and despite my very best efforts, my heels still don’t look their best. 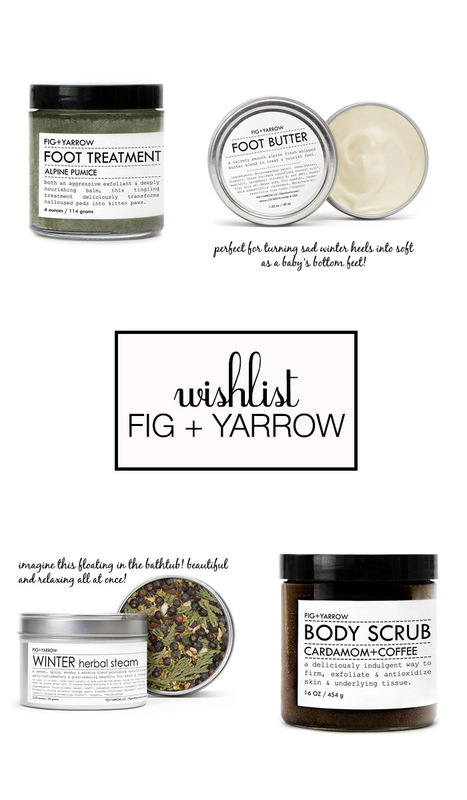 enter fig+yarrow’s alpine foot butter: the newest item on my wishlist. the brand bills it as “a velvety smooth alpine fresh whipped butter blend to treat and nourish feet.” i can get on board with that. see, i have a thing for alpine/christmas scented things. specifically, i have a thing for holiday-scented candles, but pretty much anything that smells like a tree makes me happy. hence, i’m pretty sure that fig+yarrow’s foot butter will be a home run in my book. and since i can’t resist anything with pretty packaging, nor can i get enough of at home spa treatments, i’m also thinking of splurging on the winter herbal steam (at home facial here i COME), coffee + cardamom body scrub, and of course, the alpine foot scrub. HELLLOOO, at home pedicure. ps: friends, fam, there’s still time to order before hanukkah ends! just kidding. sort of. 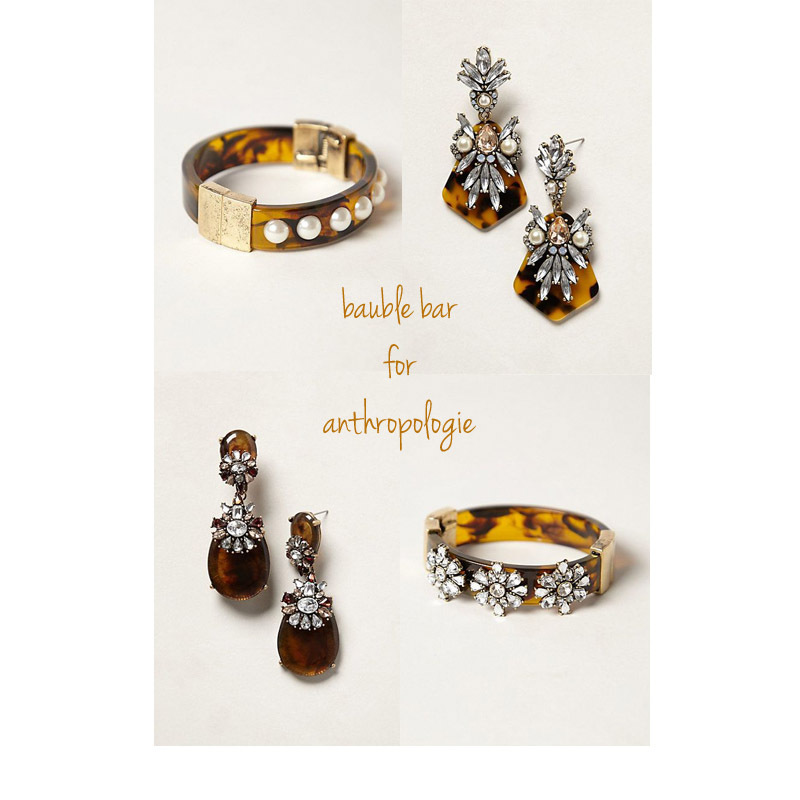 have you guys seen the new baublebar capsule collection for anthropologie? i tend to find anthro’s jewels much too steep, price wise (though beautiful, of course), but this new collab has me thinking i can splurge on a pair or two. i’m especially fond of the gazella drops. tortoise and diamonds together? i’m in. shop the collection here. a story about me and morocco. the year i was bat mitzvahed, my grandma took my entire extended family (my cousin and i are the same age) on a 2 week trip to morocco. though i had traveled a bunch as a kid (lucky me! ), morocco was a whole other world. literally. for starters, it was in AFRICA. i mean, hi, exotic locale. it was also a place where girls with blonde hair and hazel eyes were things to be bartered for. my price was equivalent to a few nice rugs and some steaming mugs of mint tea. it was a place where the old world still had a firm hold on things, where lifestyle glossies like vogue had yet to traverse the terrain, where rivers of mud and discarded trash ran straight through the streets. marrakech, specifically, was a visceral feast. the sights, the sounds, the smells. and don’t even get me started on the leather tannery we visited one day. talk about smells, or should i say, stenches. holy moly, did i have to hold my nose at that one. as blessed as i feel that i’ve visited such an incredible place, part of me wishes i’d made the trip when i was a bit older. i think i would appreciate the country a lot more now than i did then. i suppose that’s why it’s important to travel as an adult – because your brain has formed enough to truly wrap itself around the amazing experiences that sojourning around the world bring. one thing i’m sure i would appreciate now more than i did than is the amazing color and style of moroccan interiors – from the colorful tilework to the gorgeous moroccan wedding blankets that have become all the rage in interior design over the past few years. 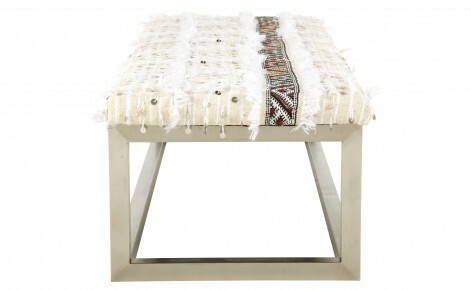 also known as handira, moroccan wedding blankets are traditional cape-like nuptial garments of the Berber women. these gorgeous pieces, worn by brides at their wedding ceremonies, are handwoven by a bride’s relatives, and can take weeks to complete. these days, you’ll see them hanging on walls, atop crisp white sheets being used as bedspreads, beneath dining tables as rugs…the design possibilities are endless. a bit sparkly, a bit sequin-y, and a whole lot of pretty, moroccan wedding blankets are a beautiful, versatile piece that the interior world can’t get enough of. 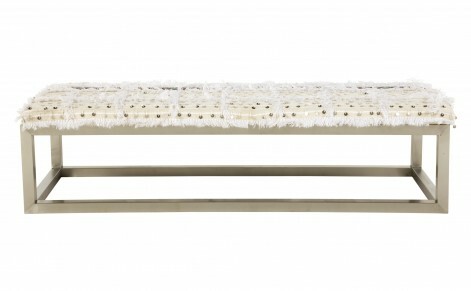 you can get the real thing by doing a bit of savvy googling, or you can snag mass market versions, which have popped up everywhere from anthropologie to jayson home (where the piece above can be found). i’ve been on the hunt for cute texting glove for a while now. i found this pair at shopbop, and while they’re cashmere, and probably extremely cozy, they’re sort of blah, design-wise. if i’m going to splurge on gloves, i want to find something a little bit more special. especially given that these gloves will be going all over the place, holding bus railings and subway poles morning, noon and night. we’ve officially hit frigid, cover-every-open-patch-of-skin season here in new york, which means i’ve got to find a good pair of gloves, pronto. lucky to me, j.crew has all my bases covered, with these chic but classic leather gloves that have been specially treated for smartphone use. i mean, HELLO, genius idea. should i tear myself away from my phone more often? yes. could i do without instagram while i wait for the 7am bus? of course. but do i want to? hells to the no, sister. a girl’s gotta check her instagram feed even when it’s cold! 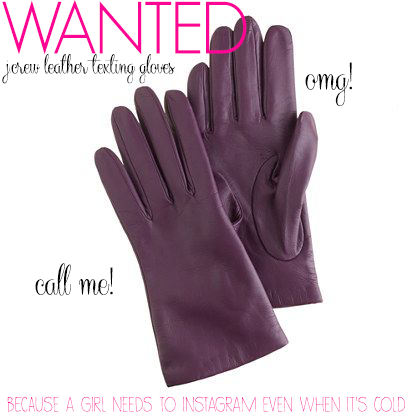 and for that, i present to you, these j.crew gloves, officially on my WANTED list.